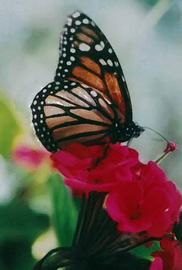 Come with Deborah Welker as she visits the famed Monarch Butterfly Sanctuary in Mexico. We see the Monarchs leave their clusters as the sun warms their wings, then rest on gorgeous flowers to sun themselves before flying down to drink from a shallow stream. Along the way, Deborah meets American, Canadian, and Mexican visitors, and shares with them their wonder and delight at the beauty of the millions of butterflies and the superb fir forest in which they hibernate.